POLSON–The Polson City Commission voted unanimously to approve at $17.32 million budget for the upcoming 2018-2019 fiscal year at the Sept. 5 meeting. According to the budget, the city’s total estimated revenue for the fiscal year will be $16,269,907. 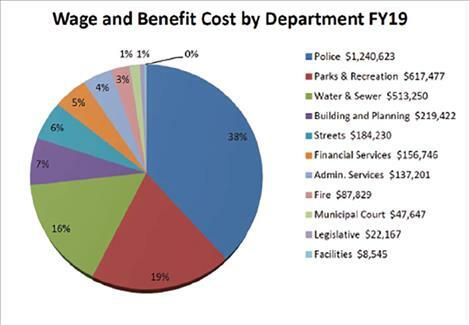 The city’s budget allows for $17,323,113 in expenditures. The deficit will be covered by reserve funds. A public hearing on the proposed budget was held on Aug. 27. The budget overview stated that this year’s tax revenue was less than that of last year. The Department of Revenue re-assessed centrally assessed property in the city and assigned the property lower values than they had previously. According to the budget overview, cities around the state have had property re-assessed with similar results. Commissioner Stephen Turner asked city staff to explain their justification for including an $8,000 movie projector, screen, and sound system in the Parks and Recreation budget. The budget states that the equipment will be used for a Movie in the Park Program. City Manager Mark Shrives said that previous concerns about the labor costs for movie equipment set up could be alleviated if local groups hosted film viewing events rather than the city. These groups would be responsible for erecting and disassembling the equipment. City Finance Officer Cindy Dooley added that the city could apply for a grant from the state, which would cover the cost of the projector, screen, and sound system. A community member expressed his opinion on the movie screening equipment purchase during public comment at the Sep. 5 meeting. “I just do not think that it’s the city government’s responsibility to provide arts or culture, particularly when you have a negative budget,” he said. Turner also questioned the specifics of the budgeted funds for building a city-run concession stand in Boettcher Park. The golf course restaurant will manage the stand, which will replace the formerly privately operated Boardwalk Outdoor Café. Director of Parks and Recreation Pat Nowlen said that the total cost of building and equipping the new concession stand would be $56,000. According to Nowlen, the city expects the stand to bring in $50,000 of revenue each year. Annual operating costs for the stand are projected to be $42,000.